Daily operations of the water system is manged by the Jones County Water System located at 270 Highway 49, Macon, GA 31211. Requires all water bills to be paid on or before the 15th of the month unless the 15th falls on the weekend, then it is due the following business day. 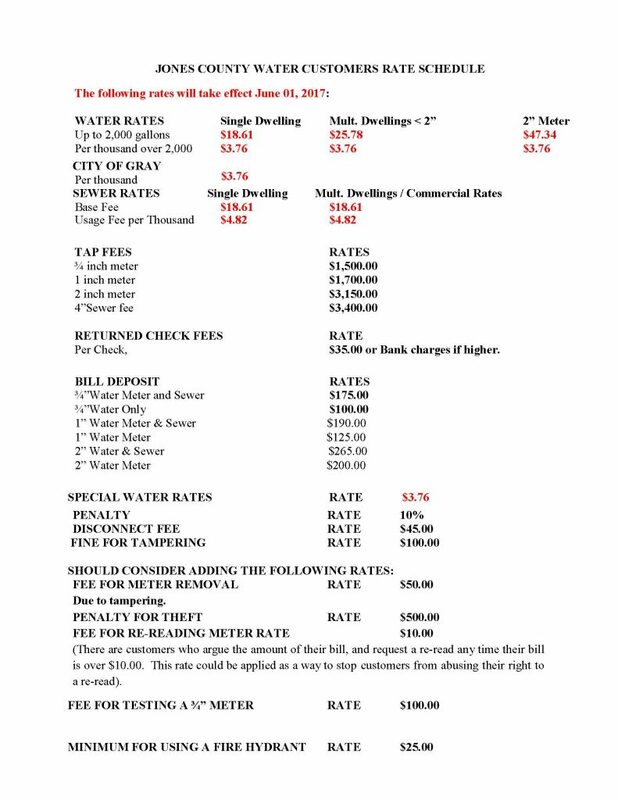 Disconnects water service for all customers 2(two) months or more behind in their payments a $45.00 disconnect fee & a 10% penalty is added to the balance and must be paid in full prior to restoration of water service. Accepts payments by cash, check credit / debit cards or money order. The office offers online payments. All new customers must setup service and complete the necessary forms at the Jones County Water System Office located at 270 Hwy. 49 Macon,Georgia 31211.Our normal business hours are 8:00 am to 5:00 pm, Monday through Friday at the Highway 49 office and at the Government Center. Has two convenient payment drop boxes. Their locations are Jones County Water System Office and KNA Grocery/CITGO Station 1359 Highway 22, Haddock, GA 31033. New accounts require a $100.00 deposit to initiate water services. The deposit for water and sewerage is $175.00, for a three quarter inch water meter. This deposit is refundable upon closure of the account. **Water use may occur at any time of the day on the assigned days, however, landscape watering is discouraged between 10 a.m. and 4 p.m. because of its limited effectiveness.